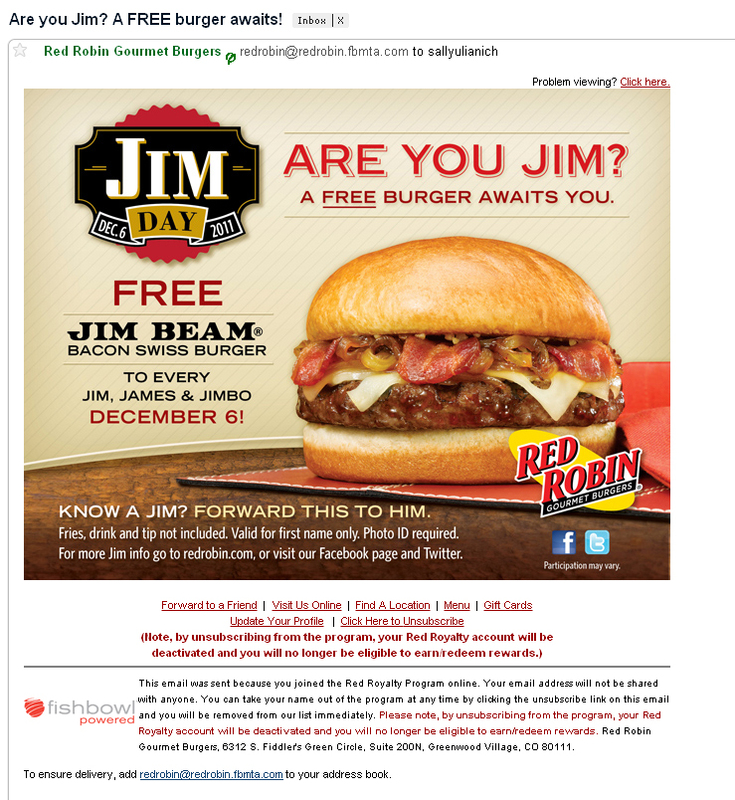 I received an e-blast from Red Robin today with the subject reading “Are you Jim? A FREE burger awaits!” I was a bit excited because I recently signed up for their royalty card and had thought maybe they confused me with someone else—nevertheless, they think I get a free burger so maybe I’d take them up on the offer! I did forward it on to my father-in-law, Jim, but then I started to think about how it made me feel. Granted I’m a vegetarian (yeah for RR Boca burgers) and I’ve sworn off Red Robin for receiving poor service the last few times I’ve been there, but I’m also human and a fan of free stuff and equal opportunity. There were a lot of excited people, as I was in the beginning, sharing this with all the Jims they knew. There were some who were disappointed they couldn’t get the deal and hopeful for a Carol or Melissa free burger day. There were all the happy Jims (and derivatives of the name) announcing their excitement for the free burger. There are those who think this is a fun and cute promotion. There were the naysayers, not thrilled about being fooled into thinking they got a free burger. There were the extremists exclaiming how sexist this awful campaign is because it’s only valid for people named Jim and even states to forward on to “him,” and many even suggesting boycotting Red Robin. There were the regulators telling the extremists to calm down and just be happy for the Jims. There’s a couple sides to this reputationally-risky promotion: is it good to get any publicity even if it is negative or do the risks of negative lashing out by the public outweigh any positive attention this campaign could get? The Red Robin representative on Facebook has been commenting like crazy, making sure the rules are clear, responding quickly to positive comments and laying low in response to the negative comments. Is it wise to focus on the positive and avoid drawing attention to the negative? It will be interesting to see the reactions of Red Robin executives over the next week to see if there is an apology or if they stand behind their marketing campaign. What do you think about this e-blast: genius or disaster?